In the following review, Chris from Tool Rank points out how useful Johnson's rounded vials are because they allow for 320 degree readability without blind spots. The Glo-View technology is also explained as an added bonus to an exceptional level. 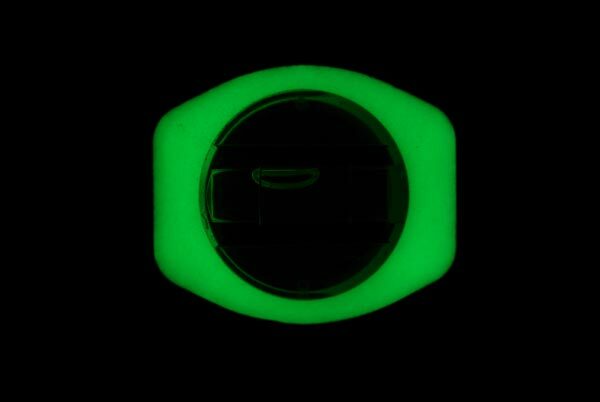 The Glo-View technology allows for enhanced readability in dim lighting without the need for batteries to power a light in the level. The 1707-4800's handholds are large and comfortable, and as Chris explains, useful to hook a chain through. This review was done by Chris Rodenius at Tool Rank and can be viewed in its original form at Tool-Rank.com. A level is just a long flat piece of material that houses a few vials and lets you know when things are plumb and/or level. It is one of the simplest tools we use on a regular basis. Being a tool that is so simple, it is hard to see how much it can be improved. But what is the most important part of the level? In my opinion it is the vial. A good easy to read vial can make all the difference. Even the most accurate level is useless if the vial is hard to see. It is in this area that the new Glo-View Johnson Level shines. Johnson sent us a 48" version to try out, and here is what we think. Johnson is the only company I know of that uses a rounded vial, probably because the design is patented. Why is a rounded vial so good? Because it is easily readable at more then 300 degrees, 320 degrees according to Johnson. At curtain angles square vials can have "blind spots", it is in theses areas that the view of the bubble is split into two. These blind spot can make the level hard to read which takes quite a bit out of the over all viewing circumference. As a cabinet installer, I am often at the height that makes my line of sight fall right into one of these blind spots. The other part of the vial that Johnson got right is the color of the vial liquid. The color has the right contrast that allows it to be seen against bright backgrounds, but is still visible in areas that are not as well lit. One of my complaints of the much more expensive Stabila level is the lack of color in their vials. In a side by side battle, I would choose the Johnson vials over the Stabila vials. The selling point of the level is what also gives the level its name, the Glo-View system. 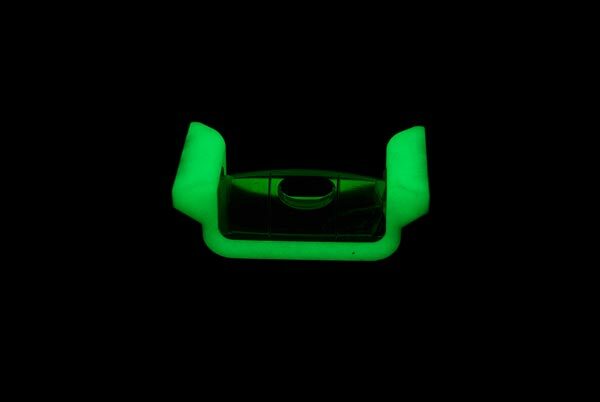 Glo-View is a a patented glow in the dark system that surrounds the vials and offers a bit of illumination in those poorly lit areas. Glo-View is also hard to photograph accurately, but the photos should give you an idea of what to expect. The feature does work, and does add a bit of extra light, but it is obviously not as good as some of the LED lighted levels. The problem with Glo-View is that you have to "charge" the vials with some form of light before they are of any use. Luckily most of us have cellphones with screens bright enough to do such charging. In my opinion the 320 degree vial is the reason to buy the tool, and the Glo-View is just a bonus. The body of the level uses a box frame design made of reinforced aerospace aluminum. This keeps weight down, but still offers a great amount of strength. The Glo-View level has an accuracy of .029 degrees, which is pretty much standard amongst all level makers. One annoyance I have with other levels is the small hole for the hand grips. Not only do I want my hand to be able the fit with ease, but I also like to use the hole to chain up my level at the jobsite. With other levels , the small hole makes it hard to get the chain through. Like I said, the body of the level is second to me, with the vial being the most important feature. I have used a number of levels over the years, and the 320 degree vial on the Johnson levels make them the winner in my eyes. 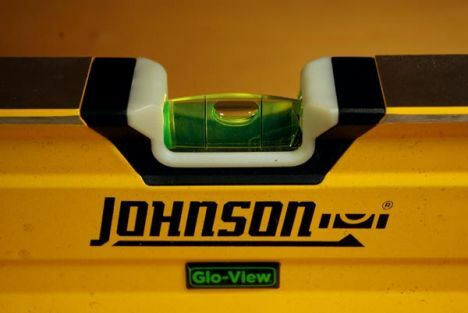 The Johnson Glo-View level is available in 24", 48", 72" and 96" lengths, but unfortunately there is no magnetic option.